Vacuum and Crane have recently been working on site at Fort Retail Park glazing the new retail units.. The Fort Shopping Park has recently had a major makeover as bosses were looking to make a ‘considerable’ investment to create a more modern retail site. The shopping park between Castle Vale and Bromford, Birmingham, celebrated its 20th anniversary last year but its design, however, was described as ‘dated’ and ‘poor’. Vacuum and Crane were appointed to carry out the glazing on the newly designed retail units. After a site survey from one of our highly experienced appointed persons, we produced a full lift plan, risk assessment and crane location sketch. 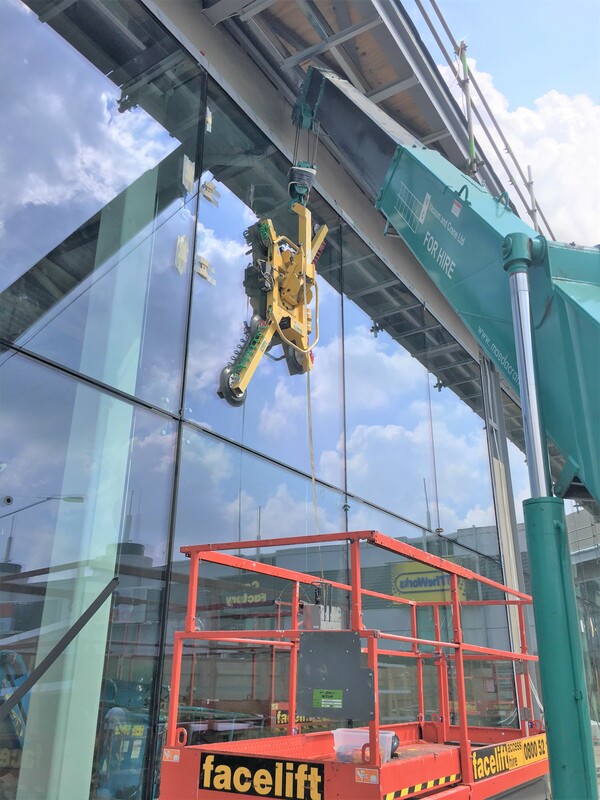 We used one of our popular Maeda MC305 spider cranes, combined with both MRTA8 and P11104 ‘4 In Line’ Vacuum Lifters, to lift the 525kg glass panels. After trialing a new design idea for two empty units last year, The Fort Retail Park Trust filed a planning application to Birmingham City Council to carry out the scheme across most of its shops on the east side of the park, which includes brands such as H&M, JD and Boots. A total elevation and scheme refurbishment modernisation was planned to create full height, full width glazing of units and shopfront heights to 6.5m. The Fort is one of the leading shopping parks in the country in the UK’s second largest city with significant visibility from the M6. Anchored by Primark and Next. Vacuum and Crane were delighted to have been involved in such an exciting project and are looking forward to working on the other new retail park projects that we have scheduled for the remainder of 2018!